At 24 years of age, she’s beginning to guess at a secret that was hidden from her as a child. The fate of many people depends on what she will do with it. At the age of four, Araminta “Minty” Cardale was banished from Eden Hall on the wings of a scandal. Twenty years later she returns to see her dying father – only to be rejected by her family once again. 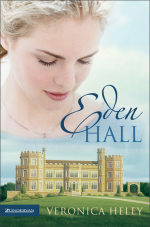 Finding somewhere to live and work in the village at the gates of Eden Hall, Minty begins to learn the truth about her father and her long-dead mother. She has yet to understand the threat she represents to family members who care only for money, power, and self-advancement, or the hope she offers to the community she is growing to love. And there are some who will do anything to prevent her finding out until it’s too late. Thankfully, Minty has friends to stand by her and, in this modern Cinderella story, an unlikely and unpredictable champion. At stake are the soul of her father on his deathbed—and the future of the entire village.